A number of vehicles have been converted from TOW carriers and FAV´s to recognisance vehicles. They were deployed to Afghanistan in August 2009 in order to be operated by the Danish forces in the Helmand province. Smoke dischargers and a cal. 050 heavy machine gun in an electrical driven armoured copula have been added. Besides the heavy machine gun a 7.62 mm light machine gun is mounted in the passenger side. Kevlar plates have been added to the sides of the vehicle for crew protection, and the original seats have been replaced with protective pocket seats. For crew comfort an electrical kettle have been mounted, and flex hoses coupled to the heater are available for the rear passengers. 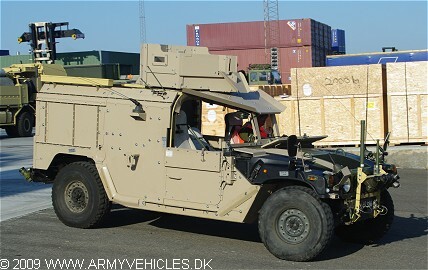 The vehicle which have been developed in a co-operation between the Armour School, the recognisance battalion at the isle of Bornholm and the Danish Defence Acquisition and Logistics Organisations is known as "Hedgehog".